Getting the error, “Getting x coordinate failed. (16881)“, when attempting to open the control point table from the LP360 Control Points toolbar. Press ‘Ctrl+C’ to copy message to clipboard. 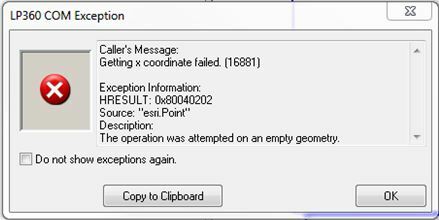 The error message indicates that at least one of the points in the control shapefile does not contain any coordinate information on the shape. Open the feature file in File Analyst and review the features. Remove the bad features. Use LP360’s Import ASCII tool to create a new control shapefile from a CSV formatted control text file so that all the features will have the coordinate information in the shape. This entry was posted in AirGon Tools, Tips and Workflows, LP360 Tools, Tips and Workflows and tagged COM Exception, control report, control report crash.